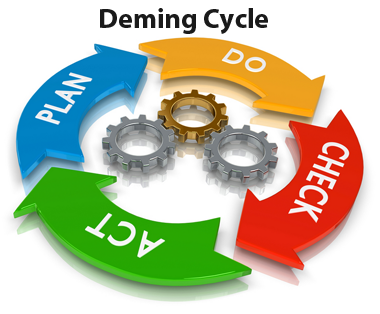 The Deming Cycle is a systematic series of steps for gaining valuable learning and knowledge for the continual improvement of a product or process. This cycle is also known as the Deming Wheel and as the PDCA Cycle for its initials Plan, Do, Check and Act. This concept and application was introduced to Dr. Deming, considered by many to be the father of modern quality control, by his mentor, Walter Shewhart. The initial concept was “Plan, Do, See” and its aim was to help organizations analyze and measure their process to identify sources of variations that cause products to deviate from customer requirements. This was then modified by Deming as Plan, Do, Study and Act and later as the Plan, Do, Check and Act Continuous Improvement Cycle that is known today. In this first phase, the situation that needs to be changed or improved must be identified, investigated and understood. After understanding the problem and its root cause, a potential solution to it must be developed. This phase involves the implementation of the action plan, preferably on a trial or pilot basis. During this phase data is collected and documented to measure the effectiveness of the actions taken. Problems and areas for improvement need to be detected in order to make the necessary changes in the Plan phase. Depending on the success of the pilot, the “Plan-Do-Check” phase can be repeated to incorporate any changes. This is the final phase. After being satisfied with the outcomes of the “Plan-Do-Check” phase, the actions can be fully implemented. Identifying new solutions and improvements to processes that are repeated frequently. Testing different solutions and improving them in a controlled way before selecting the best one for full implementation. Ensuring the use of resources on actions that will bring the expected results. This cycle is also the basis for many management systems that are widely used in all types of organizations today. Standards such as ISO 9001, ISO 14001, OHSAS 18001, just to name a few, were developed based on the PDCA cycle for the full implementation of the management systems that they are devoted to. Are you interested in learning how this cycle can help you and your organization? Get in touch today to learn more from Workplace One.